The deadly clashes in February left at least 10 people dead and damaged Preah Vihear temple, a World Heritage site. Cambodia and Thailand are close to reaching an agreement that would put a monitoring mission along the border, the site of deadly clashes in February, officials said Tuesday. 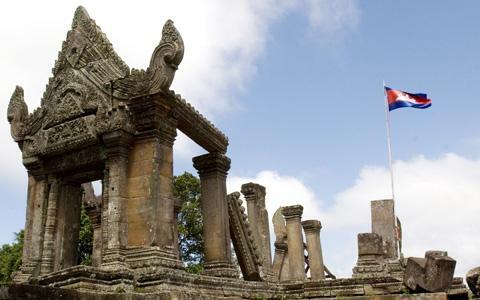 The two sides must agree to terms of reference in order to allow observers from Indonesia, which as the current head of Asean helped broker the agreement after fighting over the border left at least 10 people dead and damaged Preah Vihear temple, a World Heritage site. Indonesia cannot send observers until both sides agree to the terms, he said. The terms include the duties of a monitoring mission and where observers would be located. Tene declined to disclose details of the current negotiations, but he said Cambodia and Thailand have agreed to all but one point in the terms. Thai Foreign Affairs spokesman Thany Thongphakdi told VOA Khmer the main point of discussion is now the area of coverage for the observers and where they will be dispatched. Indonesia has agreed to send 30 observers to the border, with half on each side of the border near Preah Vihear temple, where Thailand and Cambodia disagree on border demarcation. Cambodian officials say they have already agreed to the original terms set out by Indonesia. Indonesian officials say they want an initial meeting with all three countries on March 24 and March 25, but a definitive date has not been set. Cambodian Foreign Affairs spokesman Koy Kuong said Cambodia expects talks on those dates. However, Thany said the meeting may have to be pushed to April 7 and April 8, due to a scheduling conflict for Cambodian and Thai officials.